I can’t help but feel judged. I’m rooting through trash cans and lost luggage looking for supplies as she stands behind me pretending to admire the view. What must I look like to her? More vagrant than knight in shining armour. You can tell she’s taken pity on me as she tosses me a coin she found. “Here, you keep this.” Thanks, Elizabeth. In fact on many levels, thank you, Elizabeth. 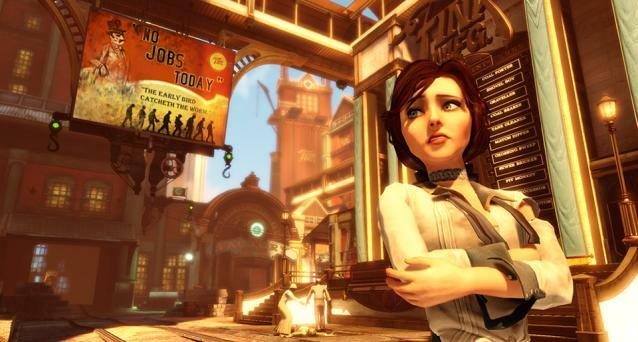 Though she is absent from the first few hours, Bioshock Infinite is all about her. She’s the reason your there, the means by which the story evolves, and a key partner through large portion of the fighting that mars your passage through the floating city of Columbia. She’s no hapless Yorda, incapable of looking after herself; she is a strong woman who initially greets you with a few well aimed books to the head. Yet despite that initial shaky start your character, Booker, and her grow to share a bond. Born through a mutual need to escape, it soon matures as they share in the horrors of the world about them, realising they’re going to need to stick together if they ever wish to leave alive. Elizabeth’s the second noticeable heroine is as many months, though her and Lara share more than plaudits for simply representing women. Elizabeth too has that moment where she is repulsed by the taking of a life, and, though the drama isn’t particular drawn out, a similar acceptance of her new way of life is realised. The pair discuss it as a zeppelin ferries them across the city and the conversation demonstrates how well written both characters are. Though there’s regret in the eyes of the girl, you are stoic given your military history; it’s just one example of the two sharing a moment along the journey as a greater tale unfolds. All this is set against the backdrop of the airborne Columbia, a city made up of many floating islands that has seceded from the United States. It’s a world away from the original Bioshock’s dark, closed, decaying world. Instead we find a sun-drenched place full of open walkways and painted in bright, pastel shades. It’s a visual treat, made all the better with the completeness of the world as it’s not only a painted façade. Large numbers of shops and streets are all accessible, letting you drink in the atmosphere of this initially upbeat town. Set in an alternate 1912 the citizens go about their business, gazing happily down on the world below and seemingly quite content (or oblivious) in having you listening in on their conversations. The almost insignificance of the local tittle tattle is pleasing enough, but looking in every store, taking part in the local fayre, or simply reading every lovingly created poster, advert and art piece all proves again Irrational’s ability of making not just games but worlds. Rather than moving the adventure along, it’s easy enough to spend large segments of time simply looking at things. There’s a dark undertone hidden beneath, however. Founded by a white supremacist known as The Prophet, there’s racial oppression throughout Columbia and an almost religious fervour about its population. It makes for some deeply uncomfortable moments as the townsfolk openly use very racist language when describing the minorities living amongst them in a manner that is usually shied away from in mainstream media let alone games. It’s a deeply interesting and brave angle to approach and this persecution persists as an undertone throughout. These tensions soon reaches breaking point and, for reasons I would prefer not to spoil, you are forced to defend yourself. Being a military man you are a dab hand with pistols and rifles, but in addition to these are your vigors, plasmids by another name. They grant you the ability to suspend others in midair, summon forth a flock of murderous crows, or even bewitch entities to fight on your side. They are drip fed to you as you progress and can open up some equally satisfying and lethal combinations. At times the guns were all but forgotten as at first I’d wash away my foes with a tide of water before sending a jolt of electricity through their now drenched bodies. Or alternatively sending out the murder of crows to peck at them before dropping a fiery cluster bomb in their midst. This may bring gleeful memories of tormenting splicers rushing back from the first two Bioshocks, but there is more. Columbia is also criss-crossed with skylines, tracks by which people and goods can cross from island to island, and by riding these you can cause further chaos. Jumping up and latching on, be it for a dramatic entrance or hasty escape, they add a verticality and speed to combat previously unknown in the series. The plodding Big Daddy is a world away from fights that can take place on multiple levels, battling back and forth across surprisingly large venues. All this time Elizabeth is keeping herself busy. It’s made quite clear that she can take care of herself and whilst she keeps her head firmly down the girl is adept at keeping you well stocked with ammo and health, with a further knack of making weapons and cover appear later on. It all makes her a very valuable ally and strengthens the connection between the pair. We’ve seen enough AI shooting poorly in our time to make us question their worth at all, and so to remove that and consider what actually makes a sidekick useful is a masterstroke. The pacing of each encounter is just right, too. There are no drawn out slogs by which you could grow weary of the battles. Each is used to tease you through the tale, leading you from chapter to chapter, the content revealed by your chats with Elizabeth and through the taunts of your enemies. Together with the audio logs strewn about the place, it may not be the most complete story telling experience but because they all happen in the world you find it far more compelling. There are scant few cutscenes that you are forced to sit through, at each point that the story evolves and moves forward you are there in the middle of it, experiencing it first hand with Elizabeth. Together. Whilst our original trip to Rapture was a horror story, detailing the twisted results of great minds gone astray, this keeps the Bioshock spirit but moves in a different direction. The dystopia may be a common theme with plasmid providing you with the means by which to destroy it, but more so than anything this is a story of you and Elizabeth. Though I may be disappointed the tough racial angle wasn’t completely seen through, the layers they pour upon the story, continually shifting just when you think you’ve guessed where it’s heading, proves it as one of the finest in its field. Infinite is a game that gathers momentum. A considered, impressive start gives way to a tale and to a combat system that both compete to steal the limelight in a world that effortlessly amazes. Amazed. Will amaze.